Stella Alesi has resided in Austin, Texas for the last 25 years. Her work has been exhibited in commercial and university galleries throughout Texas, as well as being purchased for many private collections. 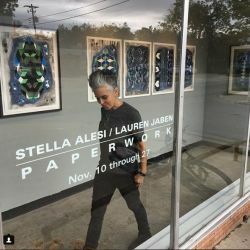 Her most recent exhibit took place in November as part of the "Femme Abstract" exhibit in Austin. Currently a full time painter, Stella taught photography at the Austin Community College and ran a successful photography business for over 15 years.